SARASOTA – Sarasota County staff will host an open-house workshop, 5-8 p.m., Thursday, Sept. 5, at the Englewood Sports Complex, 1300 South River Road, Englewood. County staff will present a newly completed study that looks at neighborhood flooding due to excessive rainfall. Preliminary findings highlight areas that are prone to flooding in the Lemon Bay coastal watershed. Staff will discuss areas that are being considered for potential flood risk mitigation projects. Representatives from Sarasota County Stormwater, Environmental Utilities, Public Works and others will be on hand to answer questions and take input from residents. "This workshop is about gathering input from residents about flooding in their neighborhood and what we can do together to try to mitigate it," said Scott Woodman, specialist with Sarasota County Utilities. "We used new technologies for this study and we are hopeful the accuracy of the results matches up with what residents have observed." Developed as a requirement to Sarasota County's Comprehensive Plan, the study was paid for by Sarasota County with a 50 percent matching grant from the Southwest Florida Water Management District (SWFWMD). 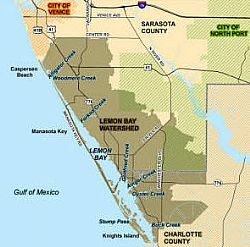 The Lemon Bay Coastal study area begins from Center Road in Venice and continues south to the Charlotte County line, west of US-41 and State Road 776 through Englewood.